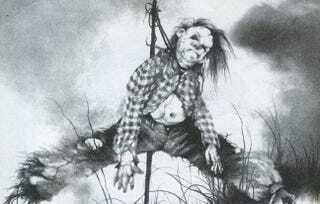 Guillermo del Toro is starting development on the Scary Stories to Tell in the Dark movie. This is great news! Not just because of how good del Toro is, but because he’s a fan of the source material. When last we heard about this movie, John August was being hired to write the script. Deadline, which had the exclusive, says that it’s August’s script that is in del Toro’s hands now. Del Toro is signed on to produce the movie and to potentially direct, although any chance of him directing is probably going to depend on his schedule, which is packed full of both confirmed and rumored projects. We still don’t know what the plot of the movie looks like—which means that, in my imagination, it’s “The Wendigo,” a twisted tale that still freaks me right out. But everyone’s going to fight about it, I’m sure. The solution is obviously for del Toro and company to make an ongoing anthology series. Hope that del Toro is able to take the director’s chair after all, since his live-action realizations of Stephen Gammell’s iconic artwork should prove terrifying in all the best ways.